Corpusty, from the Old Norse meaning ‘raven path’, is a large parish in the northeast of the county, on the River Bure. The two villages of Corpusty and Saxthorpe are now almost conjoined, and dominate the centre of the parish. Saxthorpe comes from the Old Norse meaning ‘an outlying farmstead of Saski’. There is some evidence for early occupation in the parish, a number of prehistoric flints have been found scattered throughout the parish, including Neolithic flints axes (NHER 6666, 6667, 6668), a jade axehead (NHER 6669), and an arrowhead (NHER 33442) which dates to the Late Neolithic or the Early Bronze Age. The sites of two ring ditches (NHER 29564, 18241), probably the remains of Bronze Age barrows, are visible as cropmarks on aerial photographs, and a Bronze Age palstave (NHER 6672) and a spearhead (NHER 31859) have been found in the parish. Iron Age coins (NHER 16301, 28973) and a chariot fitting (NHER 12987) have been found in the parish, suggesting that settlement continued to develop in the parish during the Iron Age period. Roman coins (NHER 16301, 17943), brooches (NHER 31877), pottery (NHER 6674, 6675) and other metalwork including a cosmetic palette (NHER 32737) and part of a figurine (NHER 6673) have been found, although a specific settlement cannot be identified with any certainty. In the Domesday Book, Corpusty is a small settlement, whereas neighbouring Saxthorpe was much larger, and more valuable. A church is recorded at Corpusty, rather than Saxthorpe, and St Andrew’s Church (NHER 6682) in Saxthorpe contains Late Saxon work. An Early Saxon ring (NHER 32926), brooch (NHER 34868) and part of an Early Saxon coptic bowl (NHER 32872), as well as Middle Saxon coins (NHER 33386) and Late Saxon pottery (NHER 36966) have been found in the parish, and the present villages have probably developed from the Saxon settlement on the banks of the River Bure. During the medieval period Aylmer de Valance, the Earl of Pembroke, built a large moated manor house in the parish, known locally as ‘Saxthorpe Castle’ (NHER 6681). The manor house has now disappeared, and is only visible on aerial photographs. Close to the site of the manor is an area of abandoned medieval settlement (NHER 37256), suggested by the large amount of pottery and other medieval finds recovered from the site. St Andrew’s Church (NHER 6682) in Saxthorpe was altered and extended in the 14th and 15th centuries, and contains a painted screen from the 15th century. St Peter’s Church in Corpusty in now ruined, but dates largely from the 15th century. 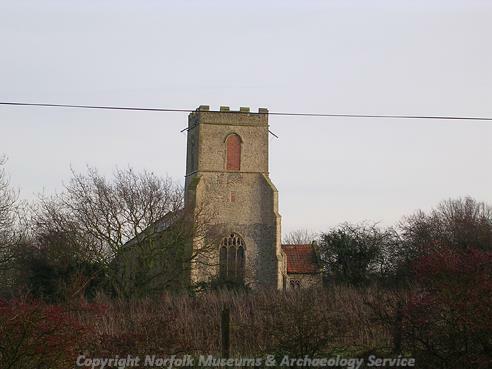 A chapel was also founded in Saxthorpe during the 14th century, dedicated to St Dunstan (NHER 12392). The tanning and the cloth industries were important in the parish during the medieval and post medieval periods. A medieval tanning pit (NHER 36118) was found during an excavation in 2001, and the site of a post medieval tannery (NHER 13416) is close to the river. 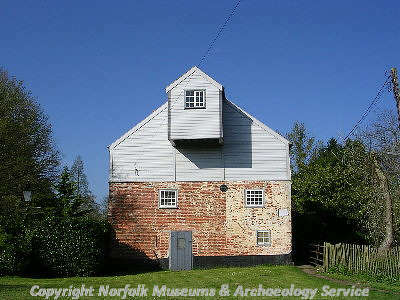 A post medieval fulling mill (NHER 6549), used in the cloth industry which bought prosperity to many parts of Norfolk, is marked on Faden’s map of 1797. Corpusty Mill (NHER 6696) dates from the 17th century. A 16th century timber framed hall house (NHER 18032) in Post Office Lane in Saxthorpe, the Manor House (NHER 11529) is a 16th or 17th century brick house, with a decorative brick porch, and Hillside Cottage, a 17th century house are a reminder of the wealth that the clothing and the wool industry brought into the parish. Saxthorpe Airfield (NHER 13625) was used as a landing strip during World War One.